For the municipality, see Siquijor, Siquijor. Siquijor [Pronounced as "See-Kee-Hor"] Cebuano: Lalawigan sa Siquijor, Tagalog: Lalawigan ng Siquijor) is a 5th provincial income class island province of the Philippines located in the Central Visayas region. Its capital is the municipality also named Siquijor. To the north of Siquijor is Cebu, to the west is Negros, northeast is Bohol, and to the south, across the Bohol Sea, is Mindanao. During the Spanish colonial period of the Philippines, the Spaniards called the island Isla del Fuego (Island of Fire). Siquijor is commonly associated with mystic traditions that the island's growing tourism industry capitalizes on. A Siquijor legend tells of a great storm which once engulfed the region. Then there came a strong earthquake that shook the earth and sea. Amidst the lightning and thunder arose an island from the depths of the ocean’s womb which came to be known as the island. Despite being a legend, modern times highland farmers have unraveled giant shell casings under farm plots, supporting the theory that Siquijor is indeed an island that rose from the sea. Prior to colonization, the island polity was home to the Kingdom (Kedatuan) of Katugasan, from tugas, the molave trees that cover the hills, which abounded the island along with fireflies. The "tugas" or molave trees were used by the ancient dwellers of the island in making posts or "haligi" of their houses because of its strength and durability that could withstand and struggle against strong typhoons and "habagat" and was proven by the house of "Totang" built near the artesian well of Cang-igdot. Most of the patriarchs of the island made the "tugas" trees to a wooden plow or "tukod" to cultivate the rocky soil for farming using mainly "toro" or male cattle to pull it through the sticky and hard rocky soil. However, before the discovery of making "tugas" as the foundations of their house, the primitive Siquijodnons dwelt in the caves as evidenced by the pottery and old tools like stone grinder or "liligsan" excavated by Mitring from the 3 caves of Sam-ang. During this time, the people of the kingdom was already in contact with Chinese traders, as seen through archaeological evidence including Chinese ceramics and other objects. The art of traditional healing and traditional witchcraft belief systems also developed within this period. During the arrival of the Spanish, the monarch of the island was Datu Kihod, as recorded in Legazpi's chronicles. The island, along with the rest of the archipelago, was subsequently annexed to the Spanish Empire. Founded in 1783 under the administration of secular clergymen, Siquijor became the first municipality as well as the first parish to be established on the island. Siquijor was, from the beginning, administered by the Diocese of Cebu. As for civil administration, Siquijor was under Bohol since the province had its own governor. The first Augustinian Recollect priest arrived in Siquijor in 1794. Several years later, a priest of the same order founded the parishes of Larena (initially called Can‑oan), Lazi (formerly Tigbawan), San Juan (Makalipay), and Maria (Cang‑meniao). With the exception of Enrique Villanueva, the other five municipalities were established as parishes in 1877. From 1854 to 1892, Siquijor was part of the province of Negros Oriental, and became a sub-province in 1901. While it was not at the center of military action, Siquijor was not spared by World War II. Imperial Japanese detachments occupied the island between 1942 and 1943, announcing their arrival on the island with heavy shelling. At the outbreak of the war, Siquijor was a sub-province of Negros Oriental, headed by Lieutenant Governor Nicolas Parami. Refusing to pledge allegiance to the Japanese forces, Lt. Governor Parami was taken by Japanese soldiers from his residence at Poo, Lazi one evening and brought to the military headquarters in Larena. He was never heard from again. On 10 November 1942, Japanese warships started shelling Lazi from Cang‑abas Point. In Lazi, a garrison was established in the old Home Economics Building of the Central School. Filipino guerrillas engaged in sabotage and the interaction during this time caused havoc on the Japanese lives and properties. During this period, Siquijor was briefly governed by Shunzo Suzuki, a Japanese civilian appointed by the Japanese forces until he was assassinated in October 1942 by the guerrilla forces led by Iluminado Jumawanin, of Caipilan, Siquijor. Mamor Fukuda took control of Siquijor from June 1943 until the Japanese forces abandoned the island when the liberation forces came in 1944. In 1943, the Japanese puppet government appointed Sebastian Monera of San Juan as Governor of Siquijor. His administration however was cut short when he was executed, presumably by Filipino guerrillas operating in the mountains of Siquijor. On 30 September 1943, the United States submarine USS Bowfin (SS-287) delivered supplies to the people of Siquijor and evacuated people from the island. On 21 February 1945, the destroyer USS Renshaw (DD-499), part of Task Unit 78.7.6, was escorting a convoy of about 50 various landing ships with 12 other escorts. At 10:59, Renshaw was attacked by a Japanese midget submarine off the coast of Siquijor, which caused extensive damage to the ship and killed 19 of the crew. In mid-1945, local Filipino soldiers and officers under the 7th, 75th and 76th Infantry Division of the Philippine Commonwealth Army arrived, and alongside recognized guerrilla fighter groups, liberated Siquijor. For a time Siquijor was a subprovince of Negros Oriental, but it became an independent province on 17 September 1971, by virtue of Republic Act 6398. The move was supported by the people of Siquijor as they have a distinct culture from those of Negros Oriental, while Marcos used the movement as a means to secure support from the people of the island to pave martial law acceptance the following year. The capital, formerly Larena, was transferred to the municipality of Siquijor in 1972 by Proclamation No. 1075, under martial law. During the martial law years, Siquijor was heavily hit by military presence. All opposition figures were jailed and supporters of the opposition were tortured, castrated, murdered, or electrocuted at the genitalia. Secret jail cells which used drowning and electric equipment were also established especially made for the opposition. When the People Power Revolution commenced in Manila, Siquijor was one of the most vocal supporters of the revolt. In 2006, the Lazi Church was added by the government as an extension to the Baroque Churches of the Philippines UNESCO World Heritage Site. The inscription of the church has been pending since. Siquijor is an island province in Central Visayas. It lies southeast from Cebu and Negros across Cebu Strait (also called Bohol Strait) and southwest from Bohol. Panglao Island, which is part of Bohol province, has a similar composition of the soil which is found throughout the whole island of Siquijor. 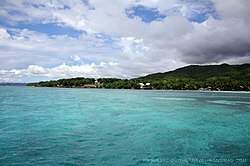 With a land area of 327 square kilometres (126 sq mi) and a coastline 102 kilometres (63 mi) long, Siquijor is the third smallest province of the Philippines, both in terms of population as well as land area: (after Camiguin and Batanes). The island lies about 19 kilometres (12 mi) east of the nearest point on southern Negros, 25 kilometres (16 mi) southeast of Cebu, 30 kilometres (19 mi) southwest of Bohol, and 45 kilometres (28 mi) north of Zamboanga del Norte in Mindanao. It is predominantly hilly and in many places the hills reach the sea, producing precipitous cliffs. At the center, Mount Malabahoc (locally known as Mount Bandila‑an) reaches about 628 metres (2,060 ft) in elevation, the highest point on the island. Three marine terraces can be roughly traced especially in the vicinity of Tag‑ibo on the southwestern part of the island, a barrio of San Juan municipality from the seacoast up into the central part. Siquijor has two different climates, dominated by Am. All climate is within Coronas climate type IV, characterised by not very pronounced maximum rainfall with a short dry season from one to three months and a wet season of nine to ten months. The dry season starts in February and lasts through April sometimes extending to mid‑May. Five of the municipalities have significant rainfall most months of the year, with a short dry season that has little effect. This location is classified as Am (tropical monsoon climate) by Köppen–Geiger climate classification system. The average annual temperature in Siquijor is 27.6 °C (81.7 °F), with variation throughout the year less than 2 degrees Celsius (3.6 deg F). The precipitation about varies 165 millimetres (6 in) between the driest month and the wettest month, with the average rainfall 1,600 millimetres (63 in) or less. The municipality Lazi has a significant amount of rainfall during the year. This is true even for the driest month. According to Köppen and Geiger, this climate is classified as Af (tropical rainforest climate). In a year, the average rainfall is 1,655 millimetres (65 in). Siquijor (province) comprises 6 municipalities. Siquijor (municipality) is the capital and most important port. There is a lone congressional district for the whole province. The Congressional Representative is Ramon Vicente Antonio Rocamora. According to the 2015 census, it has a population of 95,984. The average annual growth rate between 2000 and 2015 was 1.09%, lower than the national growth rate of 1.87% for the same period. The main spoken language in the island province is Cebuano, with English often used as a second language. Tagalog is understood and used only in response to one who speaks it, but it is rarely used in everyday conversation. Some Spanish words are spoken and understood. 95% of the island's residents belong to the Catholic Church, while the remainder belong to various other Christian churches. Despite the province's Catholic affinities, almost all of the residents continue to adhere to traditional practices that were used prior the 15th century, albeit these practices have also adopted Christian belief systems as well. Due to the ingrained and indispensable traditional belief systems, majority of residents have continued to possess a high respect for the natural environment which was revered by the ancestors of the people. Siquijor is known for its unique Philippine culture of blending Catholicism with traditional religious practices - a major part of its people's cultural heritage and identity. The literacy rate of 92.5% is one of the highest in the country. Siquijor's long-time reputation as a place of magic and sorcery both attracts and repulses visitors. Siquijor is also well known for its festivals that focus on healing rituals where incantations are sung while the old folks make potions out of herbs, roots, insects and tree barks. Among the many attractions are the beaches, caves, waterfalls, Bandila‑an natural park and butterfly sanctuary.. The most popular of them are the Cambugahay Falls and the old Balete tree, both located in Lazi. The coral reefs ringing the island offer some of the best diving in the Philippines for snorkelers and scuba divers. Dive courses are conducted by several dive operators on the island in version of PADI, CMAS* and NAUI. Siquijor was declared a marine visitor arrivals among the three provinces in Region VII. The island of Siquijor has 2 seaports capable of servicing cargo and passenger sea crafts. Siquijor also has an airfield located near Siquijor capable of handling smaller and mostly privately-owned airplanes. ^ Lore – A folk legend also has it that many years ago, when the magical island of Siquijor was still nowhere on the face of the earth, a great storm engulfed the Visayan region, and a strong earthquake shook the earth and sea. Amidst the lightning and thunder arose an island from the depths of the ocean's womb which came to be known as the island of Siquijor, hence the name Isla del Fuego, or "Island of Fire." Oddly enough, in modern times, highland farmers have found giant shells under their farm plots, supporting the theory that Siquijor is indeed an island that rose from the sea. ^ After Siquijor, Fugate became governor of Sulu province, where he was murdered in 1938. ^ "Province: Siquijor". PSGC Interactive. Quezon City, Philippines: Philippine Statistics Authority. Retrieved 12 November 2016. ^ Hackett & Kingsepp 2006. Cebu Daily News, Cris Evert Lato & Jun P. Tagalog (17 October 2007). "Neda: Tourism drove economy". Archived from the original on 21 August 2014. Coronas, José (1920). The Climate and Weather of the Philippines, 1903 to 1918. Manila Observatory: Bureau of Philippines. DOST, Mario P. de la Peña (2 October 2008). "Island butterfly sanctuary now open for tourists". Philippine Information Agency. Archived from the original on 2009-02-28. Hackett, Bob; Kingsepp, Sander (2006). Sensuikan! Operational histories of Japanese submarines in WW II. Midget Submarines Based in the Philippines 1944-1945. Hayden, Joseph Ralston, ed. (1937). "Fugate, James 1877-1938". Bentley Historical Library. U Michigan. Philippine Daily Inquirer, Linda Bolido (24 October 2004). "Who's afraid of Siquijor?". Archived from the original on 25 January 2005. "Geography". Provincial Government of Siquijor. 2012. Archived from the original on 2012-10-02. Retrieved 15 October 2012. USS Bowfin (2002). "USS Bowfin Submarine Museum & Park". Patrol Summary. Archived from the original on 2016-05-04. Visayan Daily Star, Rene Genove (10 October 2009). "Butterfly sanctuary launched in Siquijor". Archived from the original on 13 October 2008. Wikimedia Commons has media related to Siquijor.